for February 23rd are Sorrowful. On the third day, Jesus rose from the dead as He had foretold. Death has no power over Him! They had rolled the heavy stone in front of the tomb and His enemies believed that they had won. Jesus was locked in the tomb! These are truly the Glorious Mysteries for He rose triumphant on the third day! Mary Magdalene and some of the others went to the tomb. When they arrived, they saw the stone had been rolled back. Come Holy Spirit, fill us with the fire of Your love. Pour out to us Your Divine Love, Your Divine Life, so that we may partake more and more in this life and be raised to eternal life in heaven. Jesus walked with two disciples on the way to Emmaus and recounted for them all the scriptures in the Old Testament from the time of Moses that referred to Him. They did not understand that Jesus would die and then rise again. They did not recognize Him after He rose. You might think, 'oh, so blind were they! How could they not recognize Jesus?' But Jesus is in our midst this day. He is present right here with us. He is present in the tabernacle. He is present in us and in our world and the world continues to go on its way in blindness. Take the blinders from our eyes so that we may see more and more with the vision of God. As we unite with You, lead us ever closer to the vision of God. He gives us sufferings. He gives us trials. He allows all that happens to us to happen. It is in acceptance of all that He allows, and in focusing on Jesus, that we will have new life, new life in Him! He is forever present and forever ready to pour out to us His life in abundance. But we must realize that the way to Him is to follow Him. He came to carry His cross. He suffered and died so He could bring us new life! Song: I know Your love a little now, so dear You are to me. Come give me life, abundant life, I thirst to be with Thee. Who are we that God loves us so much that He sent His only Son into this world and His Son died on the cross for our redemption? Now He rises on the third day to bring us new life. He gives to the apostles the power to baptize and to forgive sins. It is through baptism that we are made children of God and heirs of heaven. We are given new life in baptism! We are on a spiritual journey. We are reborn in baptism as little babies on our journey, and our mother is our Spiritual Mother to lead us on our way to closer and closer union with Jesus, her beloved Son! Jesus took the apostles out to the town of Bethany and gave them His final blessing and left them in His peace. The ways of God are the ways of peace. The more we realize the immense love that the Father, Son and Holy Spirit have for us, that the three Persons are truly inside of us when we are in the state of grace, the more we then realize that no one can take away this indwelling of the Trinity within us. The more we pray and stay connected to Them, the more They lead us to peace. Peace, joy and happiness come from the realization of the presence of God within us! We walk this barren land not alone. We walk with the presence of the Trinity inside of us. We are temples of the Holy Spirit. It is in the realization of this divine gift that we are given that we will have peace within. As we look at Jesus all though the passion, the look of peace is always on His face, even though He suffers, because He knows the Father's love. Satan tries to distract us, tries to make us think ill thoughts. It is only in trusting God, in turning over entirely to Him our wills, our lives, our whole being, that we can have peace. It is in living in the Father's Will, in doing what He calls us to do, that we will have true happiness and peace. These are the Glorious Mysteries! Jesus truly rose from the dead! Can we even comprehend that a person who died could rise from the dead? This alone shows the magnificence of God's might! And the glories that followed! He raised His arms and ascended upward into the clouds. The apostles, as they looked from below, were awestruck to see Jesus go upward into the sky, into a cloud which took Him out of sight! They who walked and talked with Jesus, who were by His side, were filled with fear. As they were filled with fear, we should be gentle with ourselves when we are full of fear inside. We should realize that it was only through the power of the Spirit that they were transformed from fear to fearlessness. Almighty God can take us from the depths of doom and raise us to such immense heights, but it takes our will of surrendering to Him, of focusing on Him, of doing always the Father's Will, of living in the Father's Will as children who are being obedient to their Father. Nothing feeds the hungry soul but the love and the life of God! He came to give us life. 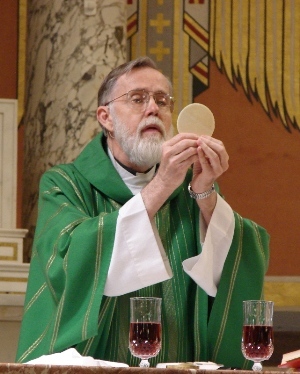 He nourishes this life with the Eucharist. This is Jesus truly present in His divinity and humanity. He feeds our life through His own flesh and blood! He feeds our life in Him through the divine love that He has left with us. He feeds this life through the Church, through the sacraments. He gives us the sacrament of penance whereby all our sins can be taken away through the power of the priest. God is so good to us that He truly feeds our life in Him! Song: I Am the Bread of Life. He who comes to Me shall not hunger. He who believes in Me shall never thirst. He, God, lets us partake in His divine life, in His divine love, and He nourishes us with His very own flesh and blood! The apostles were full of fear and they locked themselves in the Upper Room. Jesus had told them that they would be baptized by the Holy Spirit. They were locked in the Upper room with the Virgin Mary and there appeared over their heads parted tongues of fire and the Holy Spirit descended upon them. Mary is the mother of the Church. She is our spiritual mother. She is the mother of Christ! Mary is our model. She is the spouse of the Holy Spirit. It is in modeling ourselves after Mary that we become more and more like Jesus. Mary, help us to love you, to be drawn ever closer to you. Dear Spirit, please transform us in the Heart of Mary into the image of Jesus so that we may be ever closer to our beloved Father. It is through Mary's pure and tender Heart that the Spirit transforms us more and more into the image of Jesus! Dear Spirit, give us courage to go out into this world and preach the Gospel as did the apostles, who were filled with such fearlessness. These were the same men who, out of great fear, had locked themselves in the Upper Room. The key is the Spirit! Transform us, Spirit, please! Give us the courage to do what the Father is asking us to do: to help carry out the Gospel to the world, to help to spread the love of Jesus! Please outpour Your Spirit onto this Center. Please let this Spirit dwell in us! Let those involved in Our Lady of Light Ministries and the Shepherds of Christ Ministries be filled with the Spirit so that it is the Spirit that moves in them, that draws them ever closer to the Eucharistic Heart of Jesus Christ, the Son of God! Transform all who are here to have the courage to carry out the worldwide plan that the Father has set before us. He Who has chosen us to be the Apostles of the Sacred Heart, to go into this world to spread the love of Jesus' burning Heart. May the Spirit move in each and every soul and draw souls ever closer to the Eucharist. For the power is truly in the Eucharistic Heart of Jesus Christ, the Son of God! 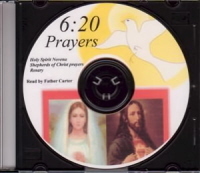 Song: Come Holy Ghost, Creator blest, and in our hearts take up Thy rest. Come with Thy grace and heavenly aid, to fill the hearts which Thou hast made, to fill the hearts which Thou hast made. And He gave to them the Eucharist to feed the life that He had imparted to them, and the Spirit moved within their souls to lead them ever closer to the love of God so that this love could radiate from their being and be seen in the world. Mary was taken up into heaven, body and soul! But she remains with us this day. She is our spiritual mother. She is the mother of the Church. Jesus is alive in the Church today. Oh, how our mother is so much with us this very day! Dear Mary, hold in your Heart all the especially anointed priests of your Son, Jesus. Hold them in your Heart and, through the Holy Spirit, lead them ever closer to the Eucharistic Heart of your Son, Jesus. It is through the pierced Heart of your Son that the sacramental life of the Church was born-through the water, which represents baptism, and the blood, which represents the Eucharist. We are given life and we are fed. Hold the Church, and all those who minister there, in your Heart. Hold them ever close to you for you are their mother. Mother the Church! Hold them so close to you! Guide them! Protect them! Lead them through your spouse, the Holy Spirit, filled with the fire of God's love, into this world in which the Sacred Heart of Jesus will reign and the Immaculate Heart of Mary will be triumphant! Help us in the Shepherds of Christ to carry out whatever is the Father's plan for renewing the Church, for spreading the love of His Most Sacred Heart to many people in the nursing homes, in the prisons, throughout the world. Give us the courage through the Holy Spirit to spread the love of the Two Hearts in this world that is in darkness. Dear Mary, help the priests, your beloved priest-sons, to realize the great mission to which the Father has called them. Help them to lead the flock to the Eucharistic Heart of Jesus Christ. 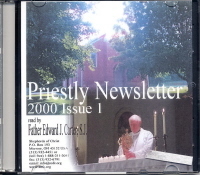 Help us to be proud to be a part of your Church, to be a part of the living Body of Christ alive in this world today. The Church is the Body of Christ. He is the head and we are the members. We are all one in this Body of Christ. Unite us ever closer with you, Mary, mother of the Church. Lead all in the Church to the most burning love of the Eucharistic Heart of Jesus Christ, the Son of God! Oh no! Mary has not left! She is truly here in our midst! She is mothering us and she is mothering the Church! There appeared in the sky a woman, clothed with the sun. The moon was under her feet and there were twelve stars about her head. Mary is Queen of Heaven and Earth! The Sacred Heart of Jesus will reign and the Immaculate Heart of Mary will triumph on this earth! There will be an era of peace. Peace is only found in God and in doing His Will. We must turn our hearts back to God, follow the Ten Commandments, do all that He is asking us to do, say we are sorry for our sins and draw our hearts into union with the Sacred Heart of Jesus. We are the children of the Father! Jesus loved us so much that He gave His very life for us. We are the favored children created uniquely by the Father and He cares for us this day with great love. Lead us ever closer to union with the Father, the Son and the Holy Spirit through the Immaculate Heart of our mother Mary! Song: Hail, holy queen enthroned above, O Maria! Hail, mother of mercy and of love, O Maria! Triumph, all ye Cherubim! Sing with us, ye Seraphim! Heaven and earth resound the hymn, Salve, salve, salve, Regina! All souls are joined in the Church with the souls in purgatory and with the angels and saints in heaven. We are all one in His Body. Let us love God, for we are children of God. We are brothers in Christ! Help us to see more and more the big picture. Help us to let go of little details and see more with the vision of God all that we need to see to do His work here on this earth-to let go of the little daily distractions, but to see that we are His soldiers marching on a world that is godless. Help us to realize that souls are at stake and that Mary and Jesus are calling us to be these soldiers to spread His love. Who are we that God is so good to us? Mary, our Queen, lead us ever closer to Jesus' Heart. Be with us as we walk with Jesus on Calvary. Be with us and lead us to everlasting life so that we may one day be united with the Father, Son and Holy Spirit forever and ever. May the saints and angels guide us on our way to eternal salvation. May we know God more and more. May He outpour His love on us, His beloved ones. We are His and He loves us so much! Song: Holy God, we praise Thy name. Lord of all, we bow before Thee. All on earth Thy scepter claim. All in heaven above adore Thee. Infinite, Thy vast domain, everlasting is Thy reign. Infinite Thy vast domain, everlasting is Thy reign! Mary, Joseph and the child Jesus went to the temple. Simeon, the prophet, inspired by the Holy Spirit, met them and told Joseph and Mary of the great sufferings of Jesus and Mary. He told Mary that a sword would pierce her heart. From that point on, Mary ever remembered the prophecy of Simeon whenever she beheld her child. When she looked at His little body, even as an infant, she knew He would suffer. Every time she clothed Him and watched Him at play, her heart was torn in her chest as she knew what He would suffer. And a sw ord, too, shall pierce your Heart, O Mary! R. See Mary as she holds the little Baby Jesus. See her as she washes His tender hands and feet. See her now as she watches as they pound into those same hands and feet the gigantic nails that fix Jesus to the cross. R. He hung for three agonizing hours on the cross against the darkened sky. His greatest agonies were not the agonies of His body, but those of His Heart for the great love He has for each and every soul. R. They pierced His Heart with a lance and what flowed forth was blood and water, the sacramental life of the Church, water for Baptism and blood for the Eucharist. His life, death and resurrection live on in the Church this day. R. His totally lifeless body was placed in the arms of His most loving Mother. As she had held the little baby body in her arms, she now received His bloodied, bruised body in her arms. This is how He obeyed the Father's Will. Jesus gave His life for us. The Father gave His only Son because He loves us so much. Mary, His Mother, our Mother and the Mother of the Church, is forever by His side. See Jesus in the arms of His loving Mother under the cross. This is love. R. His enemies rolled the stone up to the tomb and were pleased to have buried Jesus. Mary, outside the tomb, wept bitterly. The cold reality that He was dead! But death has no power over Jesus for on the third day He rose, triumphant, from the tomb! We are partakers in His divine life. Death has no power over Jesus. He is with us this day. He comes to bring us life to the full. He loves us so much!